The image below was taken from the latest Polaris World TV commercial, which was shown on UK TV today. It invites potential customers to "come and discover Polaris World, at no cost". The sharp eyed may notice, that the free visit offer is valid until 30th April 2008. 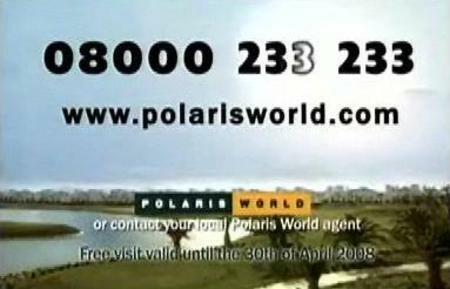 However, when we called Polaris World telesales, they informed us that the offer was still available. Lets hope that potential customers ignore the fine print, otherwise the response rates from these adverts, maybe disappointingly low.